Remember when 40 years old was old? It seems like that just isn’t the case in the NHL anymore, with the first two days of this week serving as an exclamation point to that notion. On Monday we saw an epic outing from a Duck and a Wing doing something no one else had done before him, while on Tuesday we witnessed an old Bear hitting yet another milestone! When the current season started there were five players who were at least 40: Nick Lidstrom and Mike Modano of the Detroit Red Wings, Doug Weight of the NY Islanders, Teemu Selanne of the Anaheim Ducks and the senior of the group, Boston’s Mark Recchi who turned 43 on February 1st. Modano and Weight had their seasons cut short by injury, but for the rest of the 40+ crew it has been quite a ride. Lets start with Detroit captain Nick Lidstrom – there are many who say that the 19-year veteran is playing the best hockey of his career right now, despite his age. He blasted his 15th goal of the season past Chicago’s Corey Crawford on Monday in an overtime loss to the Blackhawks, becoming the first defenseman over 40 to hit 60 points in a season. How’s this for a model of consistency: As a rookie in 1991/92, Lidstrom had 60 points, 22 penalty minutes, five power play goals, one game winner and 168 shots. This season, the Swede has 60 points, 20 penalty minutes, seven power play goals, one game winner and 162 shots. The big difference this year is his plus/minus, which will likely end up below plus-10 for just the third time in his career, but other than that he is right on track. Later that night, Teemu Selanne turned some heads in Anaheim with a penalty shot goal, a hat trick and five points in a 5-4 Ducks win over the Avalanche, which included his 700th career assist. The Finnish Flash now has 75 points in 67 games this season, with 11 of those points coming in his last five games ahead of tonight’s all-important tilt with the Flames. 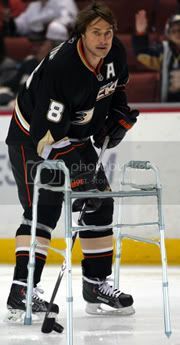 Aren’t guys that old supposed to be slowing down? Selanne has 28 goals this season after putting up 27 in each of the past two years, but the big difference in his game this time around is how he is sharing the puck. He’s up to 47 helpers so far this year, which is his highest total in that category since 2005/06. In the history of the league, only two players have put together better seasons as a 40-year-old - Gordie Howe (103) and John Bucyk (83). Not bad company eh? The final old-age accomplishment on our list this week comes from Boston Bruins forward Mark Recchi. The 43-year-old picked up an assist in a 3-0 win over the Hawks on Tuesday, giving him 1,532 career points. Recchi’s 47th point of the season moves him into 12th on the NHL's all-time points list, one up on Oilers legend Paul Coffey. The best part about this story is that it looks like Lidstrom, Selanne and Recchi will all be playing postseason hockey this year, so there could be lots more to talk about! Which of the 40+ Club impresses you the most? Kerrzy’s Notebook: Marchand hit Foul or Fair? Around the Rinks: Fine With Hornqvist Fine? Kerrzy’s Notebook: Dirty Hit by Big Z? 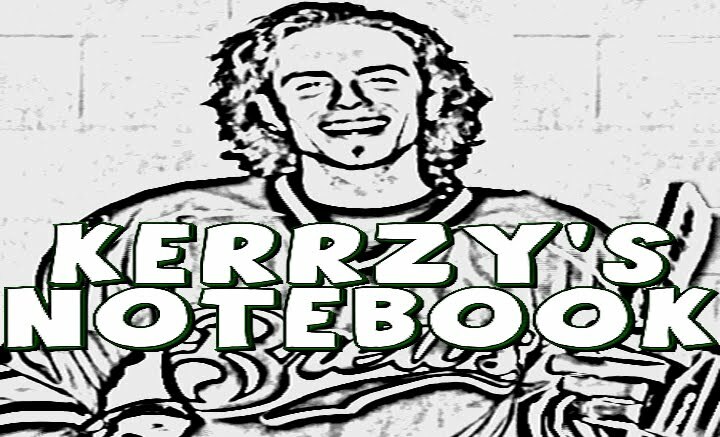 Kerrzy’s Notebook: (Strange) Olympic Drama!